The Australian stocks closed at a low rate, while investors sold off their mining stocks due to the weaker commodity prices. According to IG analyst Evan Lucas, major minors had to put up with the fall in the prices of iron ore. "The falls at Rio and BHP have got faster as iron ore continues to slide and there's a bit of a rotation out," Mr Lucas said. Developing data from China released over the weekend gave the local market a boost in the early stage of trading. Although the data and positive local retail figures were not enough to recover the losses. Rio Tinto was off by $1.38 cents at $53.80, while the Material stocks fell with BHP Billiton down by 76cents to $34.09. The Fortescue Metal Group slipped by nine cents to $3.26. Commonwealth Bank rose by six cents to $66.92, ANZ climbed 31 cents at $27.85, Westpac increased by 56 cents to $ 29.00 and National Australia Bank was higher by 30 cents to $29.30. 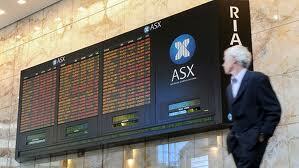 June share price index futures contract was down by 42 points at 4,891 points with 29,019 contracts traded.